A team of scientists has hacked a light-responsive protein into tadpoles, and used it as an on-off switch to suppress tumor growth. It’s a fascinating development that could one day lead to new tools for fighting cancer in humans. Optogenetics, first developed by neuroscientists at UC Berkeley, is an exciting new field that’s precipitated a barrage of sensational headlines describing how we may one day control our thoughts, memories, and even sensation of pain using lasers. The technique involves hacking a light-sensitive opsin protein into a cell—typically, a neuron. Once embedded in the cell’s membrane, that opsin acts as an ion channel, capable of regulating the flow of charged molecules in and out of the cell. All of our cells contain ion channels, but an opsin channel is special because it can be manipulated by laser-wielding humans. And by altering the electrical properties of cells, we can change how they communicate with one another, with far-reaching implications. Now, for the first time, researchers are using optogenetics to target cancer. In a study published in the journal Oncotarget, a team of biologists led by Tufts University’s Michael Levin has hacked a light-sensitive protein into frog embryos. The embryos were also given a genetic predisposition to cancer, leading many to develop tumors shortly after hatching. 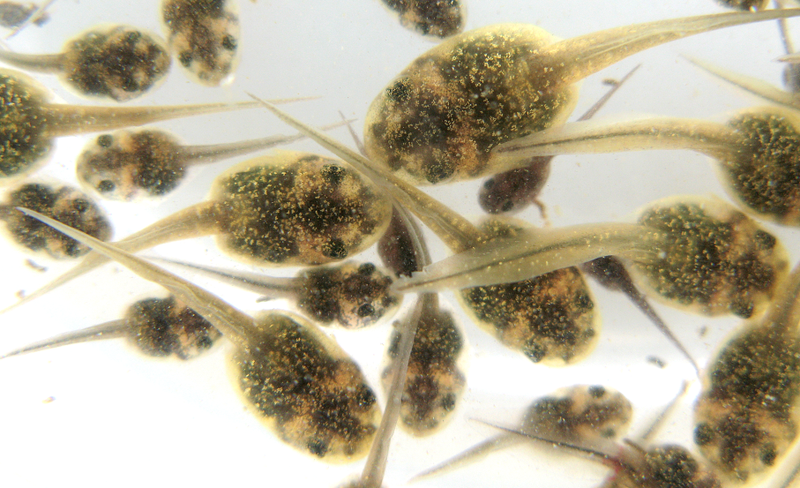 When the team shined blue laser light on their cancer-ridden tadpoles, the light-sensitive proteins were activated, altering the voltage of the cells. This caused about a third of the tumors to stop developing. While it’s an undeniably cool proof-of-concept, and while it’s always great to hear about new ways of targeting tumors without drugs or radiation, we shouldn’t expect optogenetics-based cancer treatments anytime soon. For one, cancer in frogs is not the same as cancer in humans, and it’s unclear at this stage how easily the method can be ported over to mammalian cells. More importantly, organisms aren’t primed for optogenetics by default. To treat humans using light, we’d have to hack light-sensitive proteins into humans. Perhaps we could develop some sort of optogenetics-based gene therapy that specifically targets tumors, but at this point, the complexity and potential side-effects of such a treatment are entirely unknown. Once again, optogenetics has offered us a glimpse of a weird and fascinating future. The real-world plausibility of that future is still a big question mark.